Achieving the hardness of or exceeding HRC58 through quenching and tempering, this steel features excellent wear resistance and strength making suitable for applications in dies that will receive heavy loads for cold forging and sheet metal stamping. 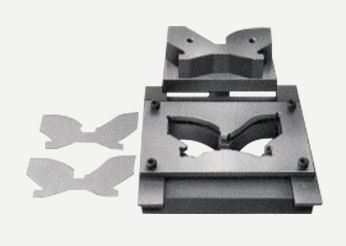 SX105V is a flame hardening steel used widely in metal stamping dies for car body parts. SX105V offers a wide range of proper heating temperature and optimal hardenability. After burner heating and following quenching in air. 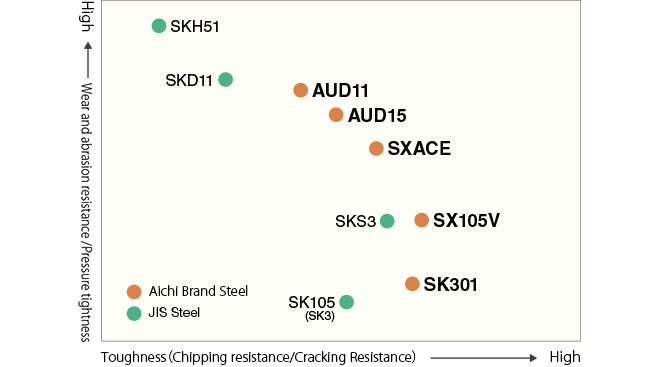 SX105V becomes easy to obtain consistent high hardness unlike in case of SKD11or SKS3. 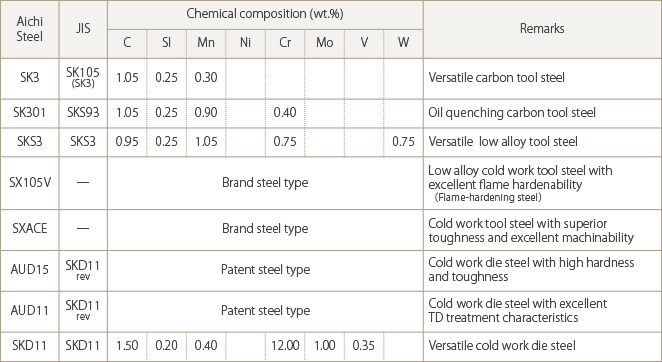 SXACE has top performing toughness and machinability in this class of steels. AUD11with superior toughness can provide improved die life than SKD11: solving problems of cracking and chipping. The excellent TD treatment properties enable improved wear resistance extending service die life even more. Cold work press dies, shearing blades, cold forming rolls, threaded rolling flat dies/round dies, cold hobbing hobs, gauges, wear resistant jigs, etc. AUD15 has high hardness (HRC62 to 63) and toughness and machinability superior to SKD11. SKD11 can be hardened in air or in pressurized gas in the vacuum furnace enabling minimizing of distortion caused by heat treatment and wire-EDM. SKS3 is a type of steel with improved hardenability, toughness and wear resistance than SK3 by adding Mn, Cr and W.
Cold press dies, jigs, gauges, etc. SK301 is a type of steel with better hardenability than SK3 by adding Mn and Cr, and oil quenching is available.